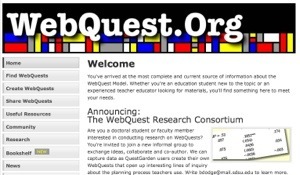 Project-based learning via a WebQuest is an excellent fit with the objectives of 21st century learning goals. Students can be engaged and challenged by collaborative activities that focus their creativity and critical thinking skills with a central goal or project outcome. Communication skills are practiced and developed both at the interpersonal level and intrapersonal level. Various media can be employed by learners to contain the content of their project. One of the challenges in the past using WebQuests or other technology-based project based learning models was the limitation of technology resources in schools, such as computer labs. Many teachers find that there is only enough time in the computer lab schedule to take students once or twice a week for a 40-minute session. The introduction of BYOD dramatically alters access to technology and can support project-based, strategies such as a WebQuest, far more effectively.